The explosive growth of U.S. shale production has capped gains of international and U.S. oil prices, offsetting OPEC’s production cuts in the first half of the year and contributing to an emerging oil glut in the latter half in 2018. OPEC has now forged a new pact with its Russia-led non-OPEC allies to contain the oil price decline to $50 a barrel Brent—a price that is not enough to balance any budget of a Middle Eastern oil producer. But the consequences of rising U.S. light oil production from the shale fields have also rippled through international oil flows and trade, making OPEC’s heavyweights such as Saudi Arabia fight for keeping market share in their most prized market and the world’s fastest-growing oil consumption region, Asia. Thanks to the booming shale production, U.S. light oil exports have increased, taking market shares out of the lighter grades that Saudi Arabia and its fellow OPEC members are exporting to Asia. Moreover, increased crude oil production in the U.S. has also resulted in higher oil product exports which, combined with higher Chinese refined product exports, have created an oversupply of products in Asia, crashing refining margins earlier in December. U.S. crude oil production has been breaking records in recent months, according to data from the U.S. Energy Information Administration (EIA). Total U.S. petroleum exports have also been setting records over the past year, EIA data shows. U.S. light crude oil exports to Asia have also grown and even with China shunning American crude, U.S. sales to OPEC’s key market Asia have held relatively steady since August this year, according to data from Kpler compiled by Bloomberg. 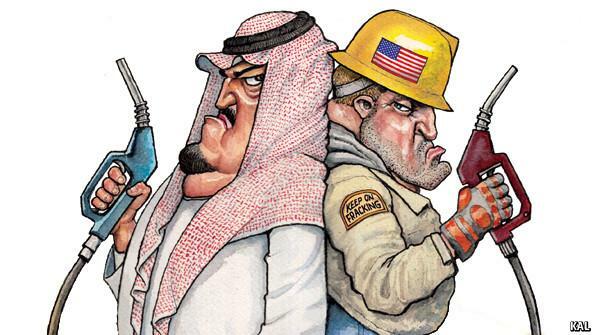 As OPEC is getting ready for another round of production cuts beginning January, Saudi Arabia for example is hell-bent on keeping its market share in Asia and has recently slashed the January prices of all its grades going to Asia, while it raised the prices for all grades bound for the U.S., Northwest Europe, and the Mediterranean. Saudi Aramco’s deepest cuts in Asian pricing were for the Super Light and Extra Light grades, slashed by US$2 and $1.50 a barrel from December’s prices, respectively. The official selling prices (OSPs) of Arab Light, Medium, and Heavy were also cut, by between $0.40 and $1.00 a barrel. The deepest cuts in the lighter grades reflect Saudi Arabia’s effort to keep its market share in Asia as competition from U.S. light oil intensifies, according to analysts. “Lights are [cut] very aggressively,” a sour crude oil trader told S&P Global Platts in early December, commenting on the Saudi pricing for Asia for January. “Guess they are trying to prevent too much US arb inflow,” the trader said. Saudi Arabia and other OPEC members also have to contend with increased refined product exports out of the U.S., as well as China, which are creating a glut of gasoline and naphtha, depressing refining margins in Asia. In early December, the gasoline refining margin at the Singapore hub, viewed as a benchmark for Asia, slumped to a loss and to the lowest level against Brent prices since November 2011. Loss-making gasoline margins weighed on Asia’s overall refining profits, which hit in early December their lowest since August 2016, despite crumbling crude oil prices, according to data from Refinitiv Eikon, as carried by Reuters. China is reportedly raising its fuel export quota for 2019 by 13 percent, which could additionally weigh on product oversupply. According to data compiled by Bloomberg, this year average monthly U.S. exports to Asia of light distillates—including gasoline and naphtha—have been nearly triple the export levels over the past two years. The gasoline and other oil products glut comes just as OPEC and allies start the new production cuts of 1.2 million bpd. Faced with U.S. competition of lighter grades in Asia, OPEC and its largest producer Saudi Arabia are fighting hard for their market share in their prized export destination.